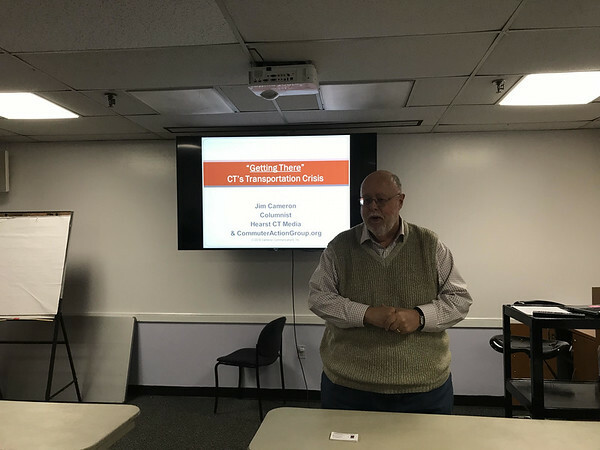 BRISTOL - Commuter advocate and former NBC News Anchor Jim Cameron outlined the state’s transportation problems Tuesday at Southington Library and argued in favor of tolls. Cameron previously served for 19 years on the Metro-North Commuter Council. His column “Getting There” appears in six Hearst daily newspapers. Cameron said his mentor is Thomas Friedman from the New York Times. He is a former reporter and a recipient of a George Foster Peabody Award. “I try to challenge assumptions, get people out of their information silos and thinking about larger issues,” he said. 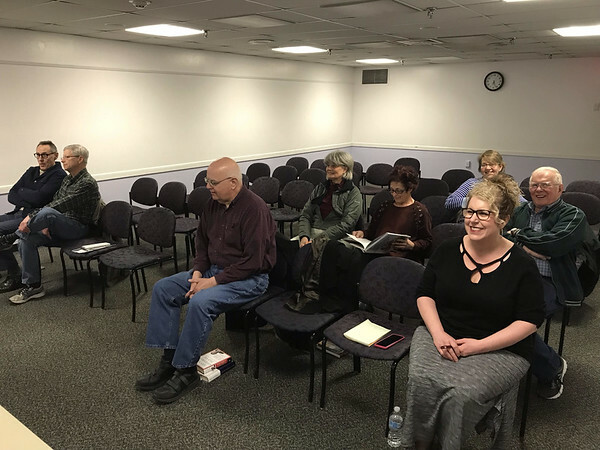 During Tuesday’s discussion, which was attended by about a dozen guests, Cameron explained a variety of issues facing the state, including crowded highways, highways in disrepair and deficient bridges. “According to a Sept. 20, 2018, CT News Junkie report, hundreds of bridges need repair,” he said. He showed pictures of bridges with rotten rebar and gridlock traffic in Stamford, which he said results in $1.6 billion in wasted fuel. He also showed the Cribari Bridge in Westport which he said will take $38 million to $50 million to repair over three years. Currently, heavy vehicles including fire trucks can’t use it. Another example was the Norwalk Walk Bridge, which he said will require $1 billion to repair. When this swing bridge opens, he said crews with sledgehammers are used to make sure that it closes all of the way again. Cameron also weighed-in on the toll debate. Cameron opposed plans to bond all the money needed for road repairs. “The more we bond for the future to pay for what we need today, the more we are asking our grandchildren to pay for what we should be paying for ourselves,” he said. Cameron argued that people are backing up highways by using the highway as a shortcut to get from one exit to the next. Tolls would mitigate this congestion. Cameron said one toll proposal would cost cars 7.9 cents per mile during peak time and 6.3 cents per mile during off-peak times. Trucks would pay 11 cents per mile during peak times or 8.8 percent during off-peak times. Trailer trucks would pay 22 cents per mile during peak times and 17.6 cents per mile during off-peak times. Cameron said Connecticut residents could also get a 30 percent discount. There could also be larger discounts for daily commuters or discounts based off income. Cameron said that, according to Governor Ned Lamont, it will cost $5 billion to make rails safe again. He also said there are 550 vacant positions in the Department of Transportation. This represents 15 percent of the workforce. In 2022, 40 percent of DOT employees will be retirement age. They have received no pay raise in nine years. Cameron cited a November 2018 blizzard during which a DOT garage needed 20 mechanics and two supervisors but was left with two mechanics and a single supervisor who quit. Among those in attendance was George Pohorilak, who had a presentation in favor of public transportation in Southington in February. Cameron also advocated bringing back a bus-way to town. He criticized an editorial in the Southington Observer in which a man was worried about busses bringing in a “lesser quality of people.” He argued that busses bring people to work who can’t afford a car. Cameron also praised CTfastrak, which he said has 15,000 riders a day. Posted in New Britain Herald, Southington Herald on Wednesday, 27 March 2019 18:21. Updated: Wednesday, 27 March 2019 18:23.